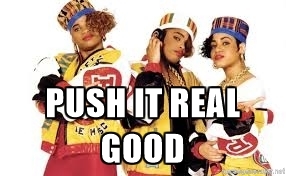 I doubt when Salt-N-Peppa said Push It, they meant to be that overly annoying person who is always being too pushy. Being pushy is a strong weakness of mine. Ask any person that is even semi-close to me and they will tell you I’m being more than honest. Let’s not really ask them, though. They’ll probably overly agree and then I would have to give them the side-eye. But seriously, being too pushy is something that most of us struggle with from time to time. Or all of the time, depending on where you are in life. Whether it’s pushing to get an answer, the truth, or actions out of people, being too pushy is never the solution. It only creates a bigger problem. So how do you know if you’re too pushy + how can you stop so that you don’t eventually push people away? I’m so happy you asked. While there are plenty of other signs that you could be being too pushy, this is a good start to evaluate whether you’re a pushy person or even simply just being too pushy over a certain thing. I know, the struggle can be real. We want what we want and want it now. But life doesn’t work like that. So let’s work together in fixing it. -First, respect other people’s boundaries. For real. If they don’t want to talk or do whatever you’re bothering them about, pushing them won’t make them do it. In fact, it’s almost a surefire way to make sure they don’t. -Understand that persistence is not synonymous with productive when it comes to prodding people. If you must be persistent, do it with that exercise program that you were supposed to start or starting that business you always wanted. -Which leads me to practice patience. Bring up how you feel + then let it go. Actually give people time to do what it is you’re requesting or expecting of them. -Evaluate why you are pushing them in the first place. Demanding things from people is selfish on your end. Why is it so important that they make that decision now? Is it really necessary for you to have an answer this second? Will you die if they don’t text back? Find out the answers to this and more on the next episode of Dragon Ball Z. Okay, so you might not find out those answers on Dragon Ball Z, but you can find them out if you search deep down + become honest with yourself. I really hope this helped. I can’t lie, doing this post put me in my own place. But we are in this together. Our days of being pushy are numbered! Besides, if you have to keep demanding things you want + need from someone…why are they in your life, anyway?